The Diametape by Pyramid has probably become the perfect go-to tool for anyone who measures o-rings and rubber belts to any level of precision. For the average Toolmonger it just looks like an incredibly simple and useful tool — the kind that makes you want to measure o-rings and rubber belts. 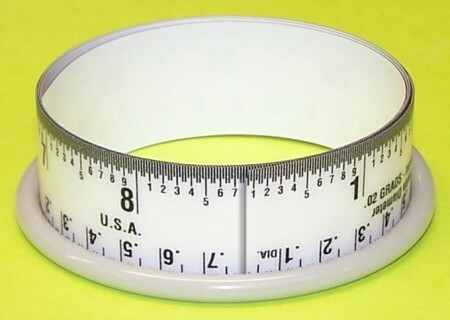 You place the Diametape — a tape measure that naturally wants to uncoil — inside a ring, and it expands to give you an accurate interior circumference or interior diameter measurement. Pyramid, a manufacturer of rubber rings (surprised? ), offers the Diametape in two sizes. The smaller tape can measure an interior diameter of 1.432″ to 10″, and the larger tape can measure from 1.432″ to 19.08″. The tapes run $17.50 for the small and $25 for the larger, available exclusively from Pyramid. Why not just cut up an old tape measure? (I think) the point is that this tape gives you the DIAMETER when you place it against the (inner) circumference. Rolling up a standard tape would give you the circumference, which you would have to convert to diameter (oh horror! math! ) in a separate operation.